This about covers the love and honor bestowed upon me by my students on August 8, 2011. Need I say more?? By Michelle Brunetti Post, Staff Writer for AC PRESS. Posted: Tuesday, August 9, 2011 7:19 pm | Updated: 7:24 pm, Tue Aug 9, 2011. Art teacher Carl Rosner, front right, celebrates his birthday with family — daughter Barrie Rosner, left, and wife of 58 years, Marilyn Rosner, right behind him — and friends at Sophia in Margate. 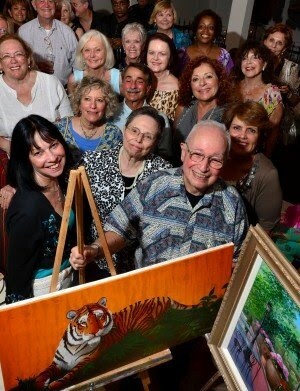 Margate’s Carl Rosner has taught oil painting to dozens of people over the years, and Monday night he walked into a surprise 82nd birthday party thrown by about 30 of his students at Sophia Restaurant in Margate. They all brought a favorite painting Rosner coached them to finish. “We don’t often see each other, but we see each other’s paintings,” said Kathy Ulrich, of Egg Harbor Township. She said students take lessons at his home, and many leave paintings there in various stages of completion. Ulrich teared up explaining how Rosner helped her work on a scene from Provence, France — from the last trip she took with her parents before they died. “Carl is like a psychiatrist and an art teacher,” she said of how he helped her handle her emotions as she painted. Lawyer William Subin, of Margate, has been taking art lessons from Rosner for about 10 years, he said. His wife, Petie Subin, said she encouraged him to explore art as an antidote to his high-pressure legal career. Party organizers were Corinne Sparenberg, of Linwood; Judy Grier, of Egg Harbor Township; and Marcia Venier, of Northfield. Venier brought a blank canvas because her favorite part of working with Rosner is talking with him at the beginning, she said. “I love every minute of (teaching),” said Rosner, whose varied career has included years as a commercial illustrator, baker, food and beverage manager, and ad illustrator for the landmark Zaberer’s restaurant in Hamilton Township, and risk manager for a Philadelphia firm. “Teaching is just as rewarding as actual painting,” he said.